Warning that “the world is exploding in terror and violence,” Sen. Lindsey Graham (R-S.C.) announced a long-shot presidential campaign in his small home town on Monday predicated on aggressively confronting threats from the Islamic State and Iran abroad. “I’m pretty sure no one here, including me, ever expected to hear me say, ‘I’m Lindsey Graham, and I’m running for president of the United States,’” he told a cheering crowd of dozens of flag-waving supporters gathered just steps from the former pool hall on Main Street that he grew up in. It’s hard to talk about Graham’s candidacy without mentioning his ideological archrival, Sen. Rand Paul (R-Ky.), whose libertarian approach to civil liberties, dovish take on military conflict and deep skepticism of an active foreign policy runs directly counter to the South Carolina lawmaker’s own stance. 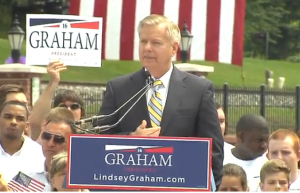 “I want to be president to defeat the enemies that are trying to kill us,” Graham said in his announcement. Both candidates seem eager to play the mongoose to the other’s snake as the 2016 presidential campaign heats up. Their conflict reached its peak in recent days after Paul successfully forced the temporary expiration of PATRIOT Act provisions that govern, among other things, the phone record spy program revealed by Edward Snowden. Graham favors a maximalist approach to counterterrorism. Graham didn’t mention Paul directly in his announcement Monday, but he alluded to conflicts with rival lawmakers back in Washington. Foreign affairs may be Graham’s calling card, but it’s hardly all he’s known for. At times he has split from GOP conservatives to broker bipartisan deals, most notably as co-author of the immigration reform bill that passed the Senate in 2013 but never came up for a vote in the House amid intense conservative opposition. Graham’s speech included a message for fellow Democrats, whom he pledged to work with the to make progress on areas of agreement should he win the White House. Our differences are real and we’ll debate them, but you’re not my enemy, you’re my fellow countrymen,” he said.